Co-habitation, whereby women of colour were ‘placed’ with foreign men to satisfy their needs, was common practise during the colonial 18th century. Monika Beata Francisco-Ribeiro explores how some women, despite the enslavement, went on to become some of history’s first black female entrepreneurs. During the reign of King Louis XIV when France and Spain sent their men oversees to plantations far from the cities, the women of their homeland were often unwilling to sacrifice their creature comforts and follow them into unknown territories, such as those in Louisiana. While the authorities of both countries needed the colonial population to grow, they were equally desperate to keep their men happy, so they turned a blind-eye to their countrymen fraternizing with the local female population. Subsequently, it became normal practice for white French and the Spanish men to pick the dark women of African, Asian, or Creole descent for their lovers. These women became known as placées. Of French origin and deriving from the term ‘plaçage’ and ‘placer’, which meant ‘to be placed with’, a ‘placée’ describes a female of colour who, during those times, was placed with a white French, Spanish or Creole male. In effect, a common law marriage. The system flourished throughout the French and Spanish colonial periods, apparently reaching its peak between 1769 and 1803; and drawing most of its fame and notoriety from its open application in New Orleans. By 1788 – 1,500 Creole placées were being maintained by white men. Placées were there to fulfil sexual duties, and to produce children. It was not uncommon that girls as young as twelve were taken as mistresses, with or without their consent. Some of them were trained by their mothers for the purpose, while some were just chosen for their beautiful ebony bodies… and immature minds. Religious and social activists, instead of confronting the practice itself expressed their anger and opposition towards it by discriminating against placées while treating them as common prostitutes. When the services of their ‘coloured wives’ were no longer necessary; the men would often dispose of their placées and simply marry women of ‘their kind’. 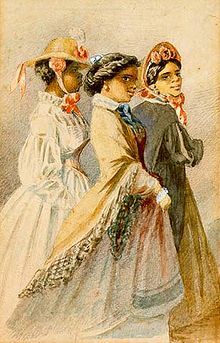 Marriage between the races was forbidden according to the Code Noir (Black Laws), which forbade black people from marrying and which has been described as “one of the most extensive official documents on race, slavery, and freedom ever drawn up in Europe”. However, some of the ‘husbands’ grew fond of their placées and would not put them nor their mulatto children aside, even after they legally took ‘respectable’ white women as their ‘respectable’ wives. This resulted in them minding two families at the same time. One for the eye and the other, it would appear, for the soul. Moreover, some of the men even went to an extent of naming their placées and their children from this liaison as primary heirs over their white family members. Some white fathers chose to quietly and carefully “place” their mulatto daughters. One of those relationships was highly successful… Eulalie de Mandeville became a placée to Eugène de Macarty, who being fulfilled in their relationship, never married outside of it. Their union resulted in five children and lasted almost fifty years. Eulalie de Mandéville de Macarty, who died in 1848, ran a dairy and became a relatively successful merchant. Upon the death of patrons and lovers placées could, at times justifiably and legally challenge and successfully win a claim for up to the third of their ‘husbands’ property. Unfortunately, more often than not, placées, after being disposed of, or after losing their patrons without inheritance, including the ones (placées) who failed to challenge the system for it (inheritance), had to quickly set aside their pain and focus on fending for themselves and their children. Such were the circumstances of Marie Thérèse dite Coincoin who has become an icon of black female entrepreneurship in colonial Louisiana. Despite being the daughter of African slaves, Marie born at the Louisiana French outpost of Natchitoches, had a good start as a child born into a stable family environment. She was trained in pharmacology and nursing from a child and gained valuable skills which assisted her in gaining financial independence in later life. Tragically, in 1758 both of Marie’s parents died as a result of an epidemic outburst. From then onwards, her life took a different path. Marie became the placée of Claude Thomas Pierre Métoyer, a French colonial merchant (turned planter). Already a mother of five children from a previous relationship, which started when she was very young, over the years Marie bore another ten (children) to Métoyer. In 1778 he freed her, after the parish priest filed charges against Coincoin as a “public concubine” and threatened to have her sold at New Orleans if they did not end their relationship. As a freed woman Marie remained with Métoyer for another ten years. There was no happy ending for their relationship though. Having become more wealthy and influential over the years and moving into a certain (higher) society, Métoyer decided to exchange Marie Thérèse for a white woman – ironically also called Marie Thérèse. To cushion the blow Métoyer gave the mother of his children some unpatented land. Marie planted tobacco on that land. With her children she also trapped bears and wild turkeys and sold the meat at the New Orleans market, alongside hide, oil and tobacco. Drawing on her knowledge of pharmacy Marie also manufactured medicine in Natchitoches Parish, which is at the heart of the Cane River Louisiana Creole community. Reportedly, Marie lived a frugal life of service to others and invested her income in purchasing the freedom for her pre-Métoyer children, her grandchildren and other youths in the neighbourhood. Although, she also invested in three African-born slaves to provide the physical labour that was becoming more difficult as she aged. After securing a rare colonial patent on her homestead in 1794 Marie petitioned for and was given a land concession from the Spanish crown. There she set up a ranch (667 acres) and engaged a Spaniard to tend her cattle. Shortly before her death in 1816, Coincoin sold her homestead and divided her remaining properties (including the African slaves, and their offspring) among her own progeny. Marie Thérèse’s daughter Marie Susanne also went on to become a shrewd business woman. As often happened among the placées’ children, Marie Susanne had also become a placée. Her first union, with a young physician resulted in a son. After the relationship ended she became a placée of yet another – this time for life. Marie Susanne also became a second-generation entrepreneur. Even more successful than her mother, she left behind an estate worth $61,600 (equivalent of $1,500,000 in today’s currency) upon her death in 1838. Though no photos of her could be found, the name Marie Thérèse dite Coincoin brings to memory one of the greatest female entrepreneurship of that era. Similar influence had also been extended throughout the lives of a few of her children who are positively mentioned on the history pages for a variety of contributions especially towards the Black society. Nicholas Augustin Métoyer, eldest of Marie’s children with Métoyer, founded St. Augustine Parish Church – believed to be America’s first church founded by and for free people of colour. As the 1970’s historical and archaeological investigations confirm conclusively, in 1796 Nicholas’s brother, Louis Métoyer, an educated and successful property owner, was granted the Cane River land, which over the years was believed to have been owned by Marie Thérèse. On this land Louise’s family built Melrose Plantation. Also known as Yucca Plantation, the site contains what may be the oldest buildings of African design built by and for Blacks in the country. Melrose Plantation and its buildings have been recognized and documented by history. Those buildings include the main house, the Yucca House, the Ghana House, the African House and some outbuildings. The last house with all of its unique features is believed to be one of the eldest buildings of African origin. The Plantation, which currently has daily guided tours, was declared a National Historic Landmark in 1974 and in 2008 was included among the first 26 sites on the Louisiana African American Heritage Trail. The fact that Marie Thérèse’s life was fraught with persecution, rejection and enslavement makes her story even more compelling. Thank God, the dark moments of her life failed to kill her spirit. Instead they helped to strengthen it, resulting in a birth of yet another – a better story. The feature ‘Your Placée or Mine?’ was originally written for and featured by Black Heritage Today magazine (UK hard copy, 2011/2012). Treasure is never left in open sight. By its nature it must be discovered. This is proof for idle minds that there is a lot of digging left to be done.